| In such a rapidly advancing technological environment, we often get lost in the updates, latest gadgets, posts, tweets, texts, etc. Our voracious appetite for better, newer, faster, lighter technology can blind us to the simple truth – the production of these new devices results in worker exploitation in developing nations. Moreover, we fail to properly recycle our old digital devices, resulting in electronic waste, or more commonly known as e-waste. Even worse, the current so-called “recycling” processes just lead to a digital dump, in which developed nations such as America export this e-waste to developing nations such as Nigeria and China. Unfortunately, the majority of e-waste produced in America is exported to developing nations and dumped in what has been dubbed the “digital dump”. The infographic below shows a map of which developing nations are affected by digital dumps from the first world nations. 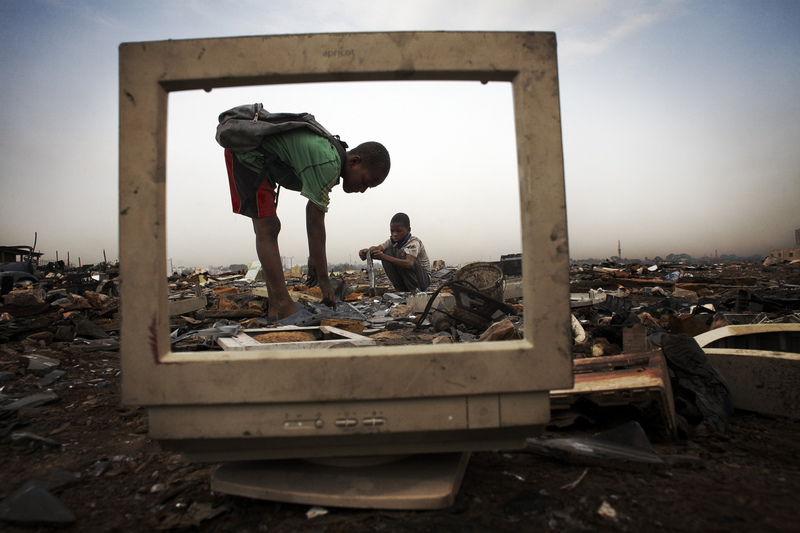 First world countries export their e-waste to developing nations, creating digital dumps. These digital dumps exist in developing nations that do not have the power or knowledge to deny this waste from entering their borders. A famous example of a digital dump includes Guiyu, China. In Guiyu, China, these villagers rely on the digital dumps for their livelihoods. They collect scrap metal and sell them to earn a living. Oftentimes, they burn the plastic coating around wires to get access to the copper inside. In addition, they burn anything that cannot be sold. Sadly, the burning of this trash results in awful health consequences as well as the release of many dangerous toxins into the air. For example, many villagers develop respiratory illnesses due to the hazardous, chemical-filled smoke. In addition, the digital dumps are usually stored near water sources, so they have completely contaminated the water sources. In fact, in Guiyu, the water supply has been polluted so thoroughly that fresh water must be transported into the village to provide a source of drinking water! 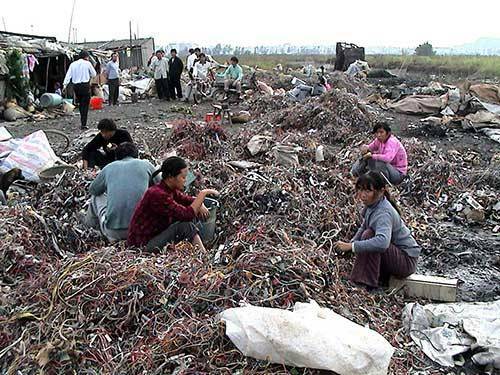 Villagers in Guiyu, China scavenging for scrap metals to sell. Despite these alarming consequences of exporting e-waste to developing nations, the United States not signed the 1989 Basel Convention, which prohibits transporting toxic waste (including e-waste) from one country to another (“The Basel Convention,” 2011). Moreover, the American government has refused to pass federal laws concerning e-waste management. As a result, half of the states themselves have passed state laws on the proper recycling methods for e-waste. However, this is not enough to rectify the major issues revolving around e-waste exportation. If the government is unwilling to cooperate to resolve the e-waste crisis they have created, then we as consumers must convince them along with corporations to step up and be responsible for their actions.